Whether you have a dedicated desk or a private suite, working out of a coworking space, there is no better way to feel and stay inspired then to make the space your very own. If you’re as passionate about staying creatively inspired at work as we are, your office is like your second home. So why shouldn't it feel and look like it?! What type of vibes are you wanting to create not only for yourself but for your clients? Posh vibes? Zen vibes? Bohemian Vibes? In order to begin curating the vibe you have in mind, you’ve got to start researching. Stop by Pinterest and browse colors and textures that may fit your targeted aesthetic. Keep in mind textiles include and aren't limited to throw blankets, rugs, pillows and cushions, tapestries, curtains, and upholstered furniture. cushions and Once you have it down, stop by your local Home Goods store to find the textiles and start reimagining your work space. For something invigorating and inspiring, don’t be afraid to add some textures such as velvet or burlap accents to add an organic flare to your space. For a serious and more focused energy, try selecting deep blue shades of textiles. For a more clean and polished feel add subtle pops or bold colors with pillows or throws. If you’re thinking adventurous and fun, give a warm color area rug a try. And for those of you that love dramatic effect? Have a bold colored upholstered chair or two. With whatever textiles you decide on, understand that the results will be a game-changer when it comes down to how you present your brand to clients. Not to mention, you will feel happier to be greeted by some great touches of textiles every day! Not only are plants a nice touch, but they also act as natural air filters and contribute to a calming environment in a big way when things get a bit hairy in the office. Plants can help you stay balanced when you otherwise might be going a little over the edge. Plants are your friends! Wondering which plants would be best for your space? Take a look at this short list of plants that are easy to keep up with. You can also check out our local green thumb, Midtown Garden Center for any and all plant needs. Flowers aren’t just for the Valentine’s day. A little pop of organic colors can go such a long way. Whether you just pick a single flower for a minimalist style vase or gather a wild bouquet for an important week ahead for you and your team, trust that it will make all the difference. Did we mention that flowers can be a great detail for colleagues and guest clients alike. 4. Add Some Art on Those Walls! Your creative space just wouldn't be complete without some art on the walls, especially pieces that really speak to your personality or your brand your brand. Think about adding small framed pieces that really bring together your space and that are on the same page as your unique aesthetic to pull your office together in harmony. In a much large space and not sure where to start? Just find framed pieces that subtly bring out pops of colors in other pieces or textiles near them. For some fresh and affordable inspo, check out Society6. 5. Fill Your Space with Reminders of Your Dreams and Goals! As an entrepreneur, you shouldn’t just focus on the now but also on what’s next. It’s inspiring to include reminders about your aspirations, whether they’re professional or personal. Want to take your business on the road as you explore every corner of Italy next summer? Want to practice being more mindful? Interested in being about that fit life? 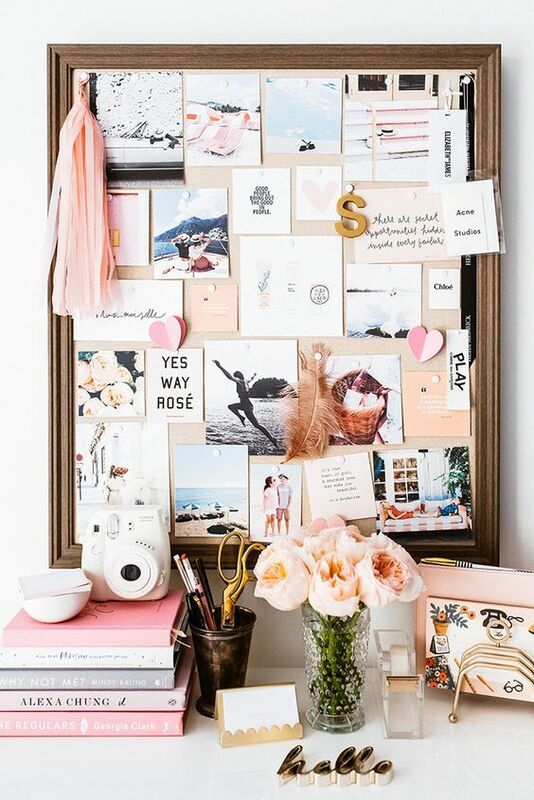 Create a vision board and be sure to pin up your top aspirations for the coming year. Not only will this keep you focused on the items you have selected but you will also stay inspired. And never forget...you totally got this! We love the idea that our members can really make themselves at home here at Minds co/work. It goes without saying that it's so much fun to decorate and make a space your very own, but it also makes your work day that much more fun! Whether you have a Dedicated desk or a Private Suite there are endless ways to make it authentically yours. Create an environment that inspires you everyday!